I missed last year's Wolfenstein: The New Order, an unfortunate casualty of the true big bads of life: being an adult and having a budget. This left a special kind of pain, as our own Jonathan Miley gave it a stunning 5 stars in his review. So when word was announced that a shorter, standalone prequel of sorts would be released, it felt like the universe was telling me that now was the time. Plus I got the code for it, so seeing that it also fit my budget in the best way possible, playing it was suddenly a lot less burdensome! This smaller release, Wolfenstein: The Old Blood, comes before BJ Blazkowicz's journey from comaville to a world controlled by a technologically overpowering Third Reich, but after his escape in Wolfenstein 3D. That escape, which was capped off by the death of MechaHitler, is referenced quite a few times, with news reports highlighting that stories of the Furher's death were greatly exaggerated. Secure in the truth, BJ's mission this time is focused on retrieving the location of General Deathshead, which just so happens to be in the possession of Nazi archaeologist Helga Von Schabbs. Helga operates out of Castle Wolfenstein, because of course she does, so together with his cohort, Agent 0, BJ manages to not only get in the gates, but execute out a fairly well played hot dog/frankfurt joke before giving a room full of Nazis the hard goodbye. It wouldn't be a Wolfenstein though if our hero didn't end up captured, beaten, and left in a prison cell, so naturally, upon exiting the scene, he is promptly captured, beaten, and left in a prison cell, though this one is less cell and more Buffalo Bill hole in the ground. This minor brush with misfortune is all to BJ's benefit though, as his prison cell serves as a meet cute to what is undoubtedly the most versatile weapon in The Old Blood: a rusty length of pipe. Capable of being used as a bashing weapon, a stabbing implement, a climbing axe, and a multi-tool, anyone would be a fool to not respect the pipe. In fact, and I am not exaggerating when I say this, I spent a better portion of the second half of the game giddly yelling "RESPECT THE PIPE" at the screen as I crushed Nazi skulls. Sure I had a knife, hell, I even had a whole arsenal of weapons, but none, NONE, gave me the weighty satisfaction of this simple metal pipe slamming down on deserving Nazi flesh. 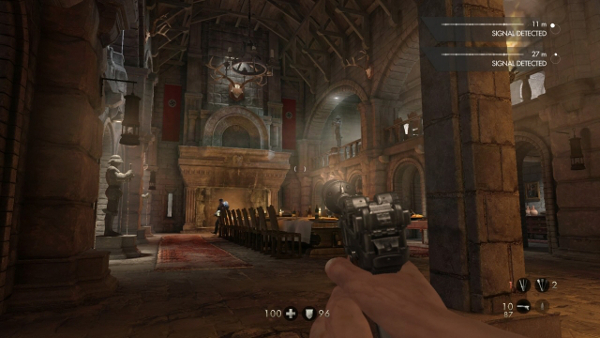 Aside from the pipe, Wolfenstein presents one of two types of combat scenarios. The first is the wide-open fire fight, a staple of the first person shooter, and a simultaneously odd combination of tense banality. Most came down to finding an area with few entrances, arming yourself with the largest weapon you have, and waiting for the all knowing, omnipresent AI to pop their heads around the corner for you to blow them off. The number of enemies involved brought tension to the proceedings, but the only times I would die in such encounters were when I grew impatient and ran into the fray. It was also different to play a shooter where health was a real number as opposed to a constantly refreshing screen color. Combined with armor, which, like health, could also be overcharged by collecting more pickups then necessary, having a stat to keep track of made me more cautious as I went on, and was helped contribute to my “skulk in the corner” method of dealing with firefights. The second type of scenario was far more satisfying, and if played smart, never had to devolve into a messy free for all. Denoted by a signal meter popping up in the upper right hand side of the screen, BJ gets a chance to play it soft, moving through the shadows to strike at commanding officers who, if alerted, will continue to call in reinforcements until either they are dead, or you are. These sequences, short of one where you were forced to fight your way to the officer of note, felt like small puzzles, and solving them was so rewarding that I often found myself restarting checkpoints if I caused an alarm. Taking the commanders out stealthily, whether with a vicious melee take down or a ranged shot from a silenced gun, also counts as an unlock to Wolfenstein's perk system. With unlocks ranging from exploding skulls with the PIPE, to killing 200 enemies while dual wielding guns, there is always something to work towards unlocking when Zombie smashing loses its luster. Zombie? You meant Nazi, right? Unfortunately, I mean yes to both. The second half of the game, set in the not-so-sleepy hamlet of Wulfburg, deals specifically with Helga's work as an Indiana Jones-esque archaeologist, which, in this case, means she of course unleashes all manner of hell on earth as the dead come back to life. Sheathed in flames, these Nazi zombies were a decent break from the same old same old of Nazi slaying, but they quickly became more shlock than camp. Their appearance would have gone over better in the form of a side story, a tall tale of the horrors right before Wolfenstein's Nazis take over everything then an actual story worked into the lore. That's not to say that their inclusion doesn't fit, as the Nazis of both the real and imagined varieties were into some cultish stuff, with an sequel outright mentioning the Spear of Destiny. It's just that their inclusion here, with the whole first act, and most of what I have heard of The New Order, focused on the technological ascension of the Reich, feels not only surprising, but a bit forced. That said, given the lengths others, like the CoDs of the world, have gone to place zombies in their game, its worth noting that The Old Blood's inclusion and presentation of the undead is not nearly as bad as it could have been. That sounds like a horrible backhanded compliment, but it's not. Now that I have successfully called on Wolfenstein canon to critique zombies, I think it's time for one final note before wrapping this up. Included in each level of each act is a bed that BJ has the option of sleeping on, if he can find them. Doing so starts up a nightmare sequence where current Super Dimensional BJ wakes up in the nostalgic halls of Wolfenstein 3D. They're not hard to get through, and by themselves, really only serve as call backs to the series's past. 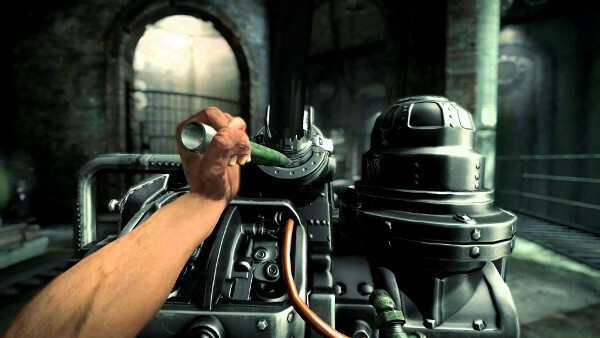 But when examined as a whole, I think these sequences, and the way Wolfenstein tends to handle rest/sleep in general. is fascinating. At least within The Old Blood, every time BJ wakes up, he is immediately in some sort of peril. At the beginning, it's waking up at the bottom of a jail hole. There's an instance where he wakes up on an electric chair, and another where he wakes up trapped in a burning building where the only exit is covered in ZOMBIE. Add to that the multiple nightmares, each beginning with him waking up in a cell, and it suddenly becomes real clear that this game isn't all one liners and ammo cans, but is one where even the actioniest of action heroes, a veritable walking cliché in many ways, suffers from PTSD. Whether or not this was something that was purposefully written in, or merely a subconscious observation making its way to the surface, it's certainly something to think about, and a thread I would love to follow into The New Order to see if it sticks. As a snippet of what The New Order has to offer, I'm quite impressed with The Old Blood. While I have hopes that when I do finally tackle the former, BJ is given a little bit of time to breathe between blood lettings, the short form on offer in this downloadable release puts on quite the show. Sure, the enjoyable bits are wrapped in the safest of cliché bubblewrap, but even that manages to be entertaining and add enough to the overall arch to warrant inclusion. Plus, you get to smash stuff with an awesome pipe. I did mention the PIPE, right? Lurching, gliding and sometimes dancing between humor and drama, action and repose, high art and low comedy, The New Colossus seems absolutely unafraid to make us think, churn our stomachs, or test our reflexes. That, in essence, is the give and take of this package. Finally at a point where I can not only recommend it, but have actually bought it myself, I am still shocked when I think about the game as a whole. For the first time, Destiny feels like it's complete. It's not perfect, far from it in fact, and I still can't entirely disagree when they speak of the package itself as bad. But I've also been unable to put it down for the past month I've played it. And that, the fun of getting into the game and exploring what it does have to offer, rather then sitting on the sidelines grumbling about what it doesn't, makes The Taken King, a worthy addition to my library. Wolfenstein 3D changed how we looked at first person games in 1992 and The New Order, while not as big of a step, may be just as important of one for the future of the genre.